Synchronicity? Or Am I Dreaming? There are some things I have to avoid completely. Otherwise, I get sucked into the vortex and end up having to claw my way out every time. Certain food groups fit in this category (see oysters, below). Certain people, too. And there was that time I had my first vodka martini. But that was long ago and the lesson was learned. But the one thing that gets me every time (and I haven't figured out how to avoid it) is puppies. And you have to say it like the Wicked Witch of the West. "Puuuuuuuuuuuuppies." Dangerously cute. Frighteningly cuddly. So infectious that I have only to see them at a distance to catch the disease known as puppy-itis. 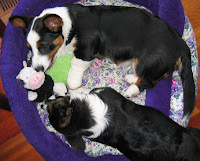 This time it's little guy named Walker, a Cardigan Corgi about four months old. He has huge front paws, big wobbly ears and meltingly big brown eyes. "And he's house-trained, and Rosey likes him," I say to Dave, who just shakes his head, knowing I'm deeply in thrall with another canine infection. The good news is that I've progressed enough at this point in my life to know that it's just going to take a few days (and nights) of togetherness for the magic to wear off and reality to set in. So before I jump into the vortex this time, he's going to be coming for a few days over Christmas to see how he does with Rosey and Chester, not to mention our shoes, since he's going to be at that chewing stage. I'm hoping that'll be the cure and the fever will pass. But then again, if the honeymoon isn't over when it's time for him to go back? Well, I'll just have to keep you posted. Hopefully he will be tough enough to deal with that delightful prankster, Chester. Tai has barely recovered from his last visit! I agree about the Cardigan pups, but for me it can be any of a number of breeds. The last one was a Rottweiler, believe it or not. But one overnight stay and we were cured (or saved, depending on how you look at it)! Perhaps you need to borrow Moki (he's a sure cure)! After keeping the Rottie (see comment, above) for a night, I realized we weren't going to be big dog people with our next dog. We'll see how it goes with Walker!